Now it was our turn to speak. 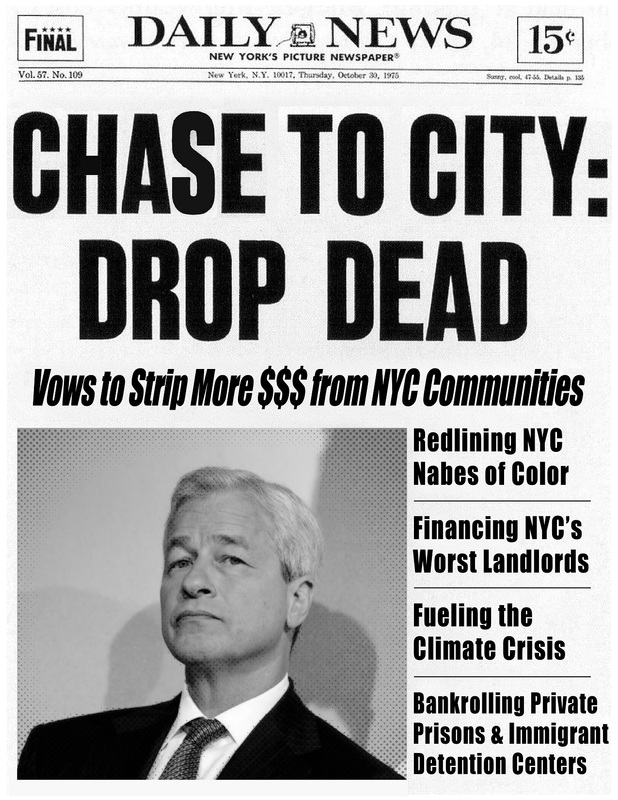 We described just five ways that Chase – the largest bank in the U.S. with $2.5 trillion in assets – has systematically harmed New Yorkers and New York communities and asked Mr. Dimon point blank: How will Chase provide reparations to the communities of color it has exploited for decades? Read our full comments to Mr. Dimon here. Let’s just say we touched a nerve – but more on that later. First, you might be wondering why we had to go all the way to Texas to speak with Dimon when Chase is based right here in New York City. That’s because Chase decided this year to hold its annual shareholder meeting at its “corporate campus” outside Dallas. And thanks to support we received from an engaged philanthropist, New Economy Project owns shares in Chase (and other companies), enabling us to attend shareholder meetings and introduce resolutions, as part of our broader work. As a publicly-traded company, Chase is legally required to hold these annual meetings, which are supposed to give shareholders the opportunity to engage with corporate executives. Increasingly, though, shareholder meetings are intricately staged, one-sided affairs. Think of it like professional wrestling. Everything is worked out ahead of time, and the meeting is mostly for show. And if it were up to Jamie Dimon, the meetings wouldn’t take place at all. Still, for activists, shareholder meetings can provide a rare opportunity to meet eyeball to eyeball with Wall Street CEOs who would otherwise not give us the time of day. The three-minute clock started counting down, and we knew Chase’s general counsel would cut us off if we ran a second over. You could say we cut to the chase, as we described how the bank’s discriminatory and abusive practices – from longstanding mortgage redlining to the siphoning of sorely-needed funds from Chase’s lowest-income customers – harms New Yorkers and ultimately drives people out of mainstream banking. Dimon’s response was a thing to behold. “You seem like a bright young man who is highly misinformed,” he said to New Economy Project staffer Juleon Robinson, summarily dismissing the facts and figures he presented. Just consider where Chase’s branches are located. Even though Chase has by far the highest total number of branches, you will find vast swaths of the city – particularly immigrant and low-income neighborhoods of color – with few or no Chase branches. Then look at how much money the bank drains from its lowest-income customers. In 2017, Chase hauled in $1.86 billion in overdraft fees alone. Research shows that banks exact 80 percent of all overdraft fees from just 8 percent of their accounts. This usurious, controversial loan product targets the bank’s account holders with the fewest financial resources, including low-wage workers, seniors on fixed incomes, and students. As we raised all these points inside the meeting, protesters chanted outside. One speaker demanded: “Stop funding death. Stop destroying our land and our water.” Back inside, organizational leaders from across the country – representing indigenous communities, immigrants, low-income people, and people of color – spoke out forcefully about the many ways Chase is destroying communities and the planet. We joined them in citing Chase’s financing of dangerous pipelines, and private prisons and immigrant detention centers. In New York City, as across the country, there’s a growing movement to divest public money from Chase and other big banks that exploit people, communities, and the planet. At the end of last fiscal year, the City of New York had more money on deposit – close to a billion dollars – with Chase than with any other bank. That’s a lot of leverage. With the Trump Administration and this Congress handing out massive corporate tax breaks, rolling back federal financial reform, and gutting the Consumer Financial Protection Bureau, Wall Street is enjoying a deregulatory bonanza – all but guaranteed to drive us all straight off the cliff. The need for local action couldn’t be clearer. Here at New Economy Project, we are working with a broad-based coalition called Public Bank NYC that is pressing for a public bank to invest in sustainable, community-led development, as a strategy to advance racial, economic and environmental justice. Through public banking, New York City can divest from banks like Chase that are actively harming New Yorkers. At the same time, a public bank would be chartered to serve the public by meeting critical needs in communities – such as permanently-affordable housing, worker, food and financial cooperatives, and community-controlled renewable energy. Imagine if New York City placed its public money in banks that reinvest public money in communities, rather than in Wall Street banks that extract profits at the expense of communities. Now that will really tick off Jamie Dimon.